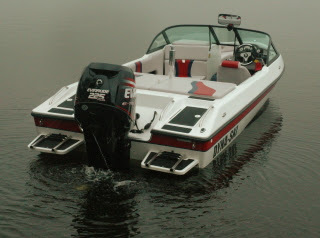 Most of the time my topics for this blog come from questions asked by people interested in Dyna-Ski Boats. This topic is no different than the others. 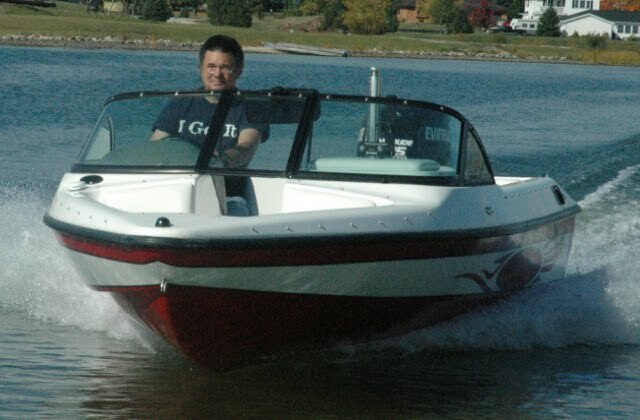 I don't think much about storage space as I am fortunate to live on a lake and have for many years including all the years that I have owned a boat. Lake Noquebay is a 2400+ acre shallow lake located an hours drive straight north of Green Bay, Wisconsin. With a big lake we get large waves including white caps from time to time. We also ski in fairly shallow water most of the time. Pretty much everywhere we ski a person can stand on the lake bottom. It is great to learn to ski on this lake as I just tell people to stand up when they fall eliminating the fear of drowning for some people. It isn't a good lake to sky ski on. Oops off topic already . . . . . . . 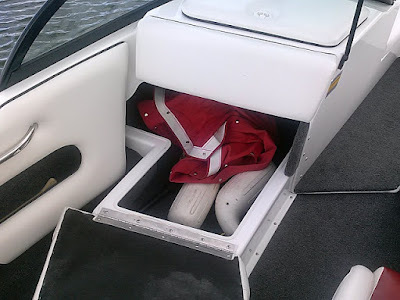 Storage space for gear is important if you trailer your boat to the lake or if you live on a lake and ever want to take your boat to a different lake. 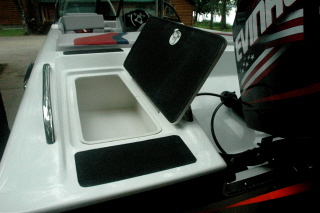 Dyna-Ski Open Bow boats have a decent amount of storage space for the size of the boat. 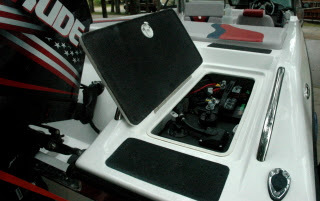 My trusty 1987 Hydrodyne 17.6 XB (closed bow) does not have much useful storage space. 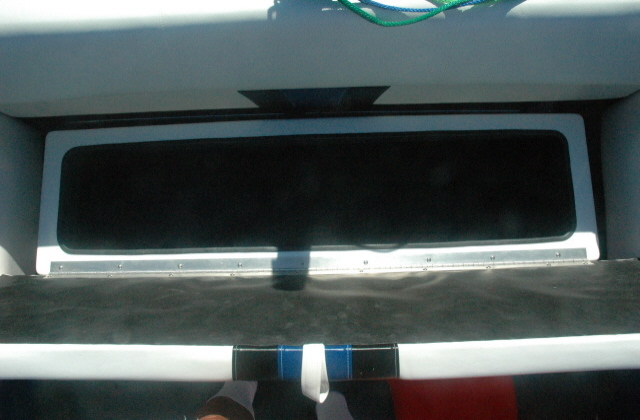 The storage space of the 17.6 Open Bow and 20' Open Bow Family skier is the same except for the area under the sun deck on the 20' Open Bow Family Skier. The 20' Open Bow Family Skier has a ton of space under the sun deck alone. Son John laying under the sun deck of the 20' Open Bow Family Skier. The space is as wide as the boat and about 30" across. 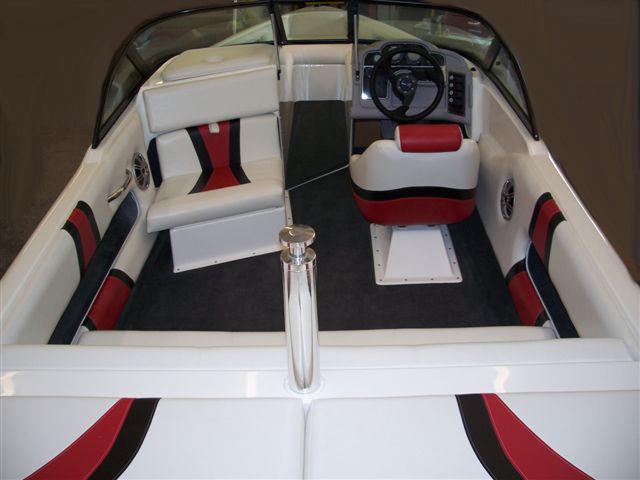 20' Open Bow Dyna-Ski with wrap around interior. forward of the sun deck or behind it. 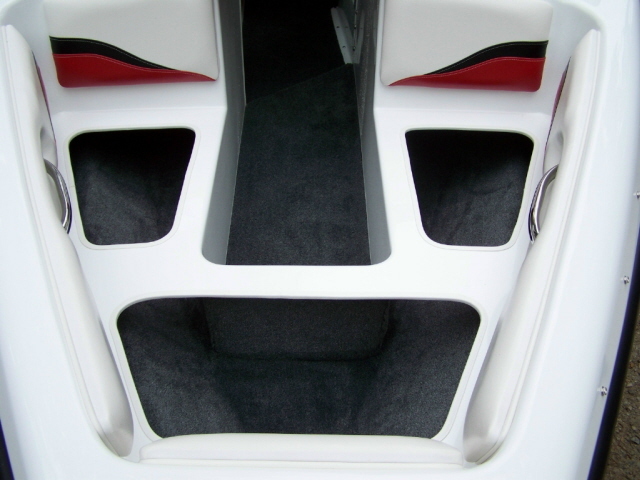 The wrap around interior has more storage space than the regular rear seat does. All Dyna-Ski Boats can be ordered with the wrap around interior. There is lots of room for life preservers under the rear seats and other small stuff. 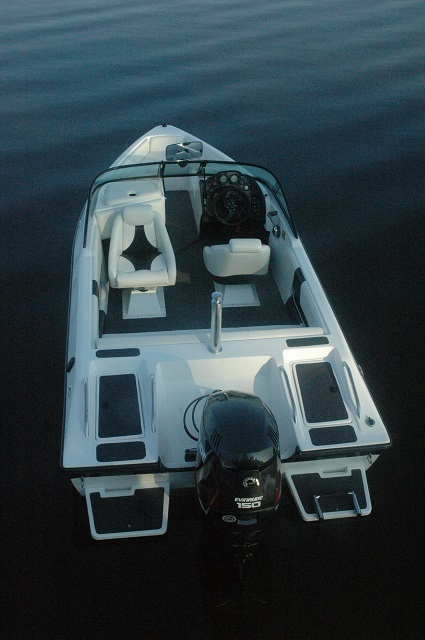 20' Open Bow with wrap around single color interior. 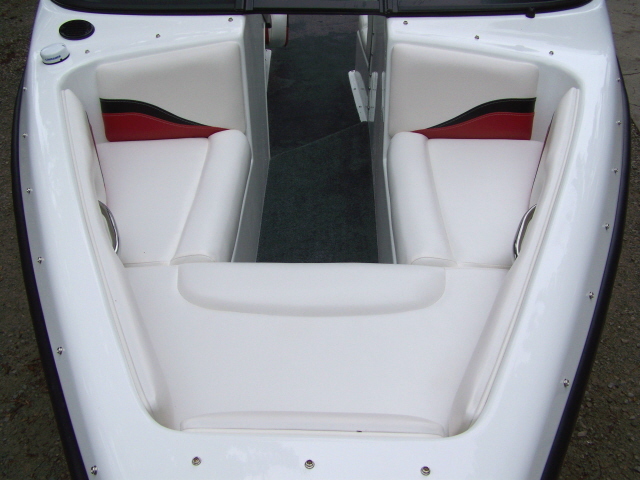 The wrap around seats are the same in the 17.6 & 20' Open Bows. inside on the sides or deleted. This is a three color interior. There is nothing dividing the three areas under the bow seats so skis, booms, extended pylons, etc. can be stored in this area. The easiest way to put long things in here is from the drivers and passenger seats in the cockpit. Access to this area is easier with the passenger bench seat. 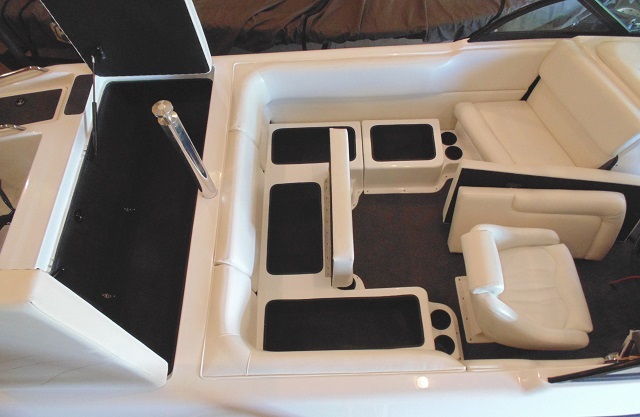 The passenger bench seat provides more storage space than the passenger bucket seat and easy access to slide longer items into the storage space under the bow seats. All the Open Bow models have two storage bins next to the motor well. The battery and oil tank can be located under this area but access is very difficult if they are. There is so much other storage space that putting the battery and oil tank elsewhere is not something I would suggest. Of course if you have a four stroke motor or a motor that has a built in oil tank the only thing in this compartment is the battery. I should point out that the standard rear seat base is different than the wrap around rear seat base. This base under this seat allows longer things to be under this seat because the base is different. 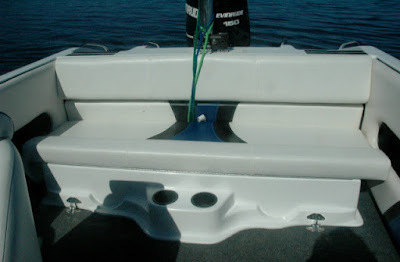 The seat base is fastened in the boat with hinges and pins although it can not be tilted forward. The pins can be easily removed and the seat base can be removed or even turned around. The seat back is attached to the motor well. 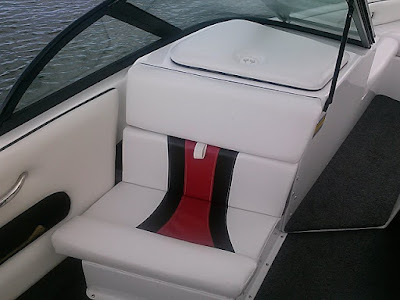 This post should give you a pretty good feel for the storage space in the Open Bow Dyna-Ski Boats. The 20' Open Bow Barefooter and 20' Closed Bow have the most interior room because there are no sun decks like on the 20' Open Bow Family Skier. If you do not need massive storage space a 17.6 Open Bow may be the hot ticket for your skiing needs. There are many other differences between a 17.6 and 20' Open Bow so that is the subject for another blog post.